What Will ACP Do For Me? That's easy. Everything is automatic. Really. Use our ACP Planner to create a single- or multiple-target observing plan (you don't have to know how to script!). Then click a button, select your observing plan and go to bed. 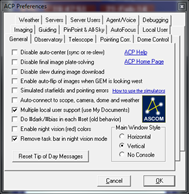 The plan will automatically use ACP's incredible set of features, just some of which are listed below. Click the links for details. And if that's not enough, ACP can be customized for special missions through custom scripting. There are hundreds of library objects, properties, and methods for astronomical applications available to ACP script developers. This is no black box!